Save time and money by knowing when to and when not to wash your clothes. It’s not a good idea to over wash your clothes, but where’s the line? We’ve got some guidelines that will help shed some light on the mystery. Your dungarees put up with a lot of wear and tear. But is it necessary to wash them after every wear? Probably not, unless you’re getting them really dirty. 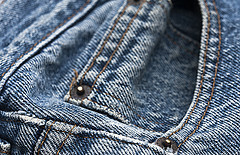 In order to maintain the fit of your jeans, we recommend washing them after four or five wears. This is the best way to ensure that your jeans hold their fit. As a way to keep the color from fading in your jeans, you should also avoid putting them in the dryer. More often than not, dress slacks or work pants are worn inside and not exposed to harsh elements. Therefore, it is usually not necessary to wash these kinds of pants until after about three wears. When it does come time to wash, make sure you pay attention to the washing instructions on the tag. If dry cleaning is necessary, stop by our laundromat in Belleville where we offer expert dry cleaning services. T-shirts, tank tops, camisoles and other clothes that are worn directly on the skin tend to absorb quite a bit of sweat and oil from your skin. As a result, you should wash these garments after every use. If they are worn for less than four or five hours, though, it is perfectly fine to wear them more than once. Pajamas can be tricky because our bodies tend to produce more sweat than we realize when we sleep. Nevertheless, you can typically get three to four wears before washing is needed. But if you wear silk PJs, you must wash them after every use! Using your own set of standards works very well in the washing process. If it seems practical to wash an article of clothing, it is probably prudent to do so. But it is usually not necessary to wash after each wearing. With this in mind, you can extend the life of your clothes while saving time and money on your laundry bill.